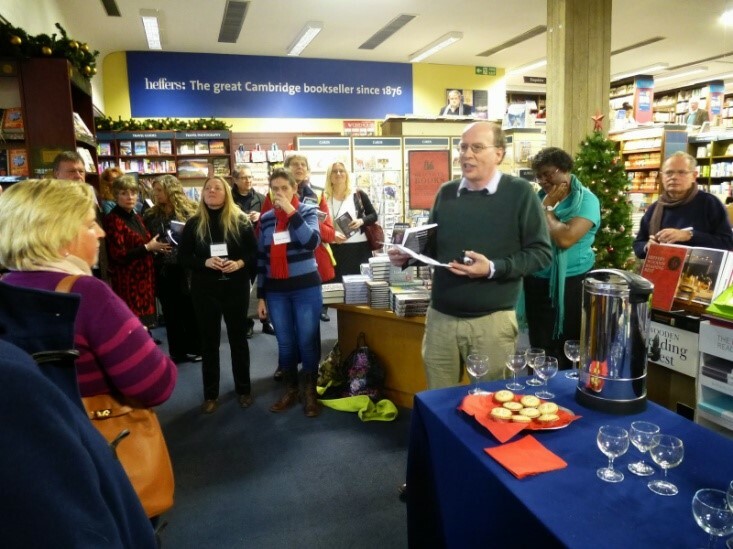 The 2014 “Christmas Chrime” party at Heffers majestic bookshop in Cambridge – a festive celebration of crime fiction complete with mince pies and mulled wine – had added value this year as it also saw the official launch of the new anthology called, very appropriately, Bodies in the Bookshop, from Ostara Publishing. 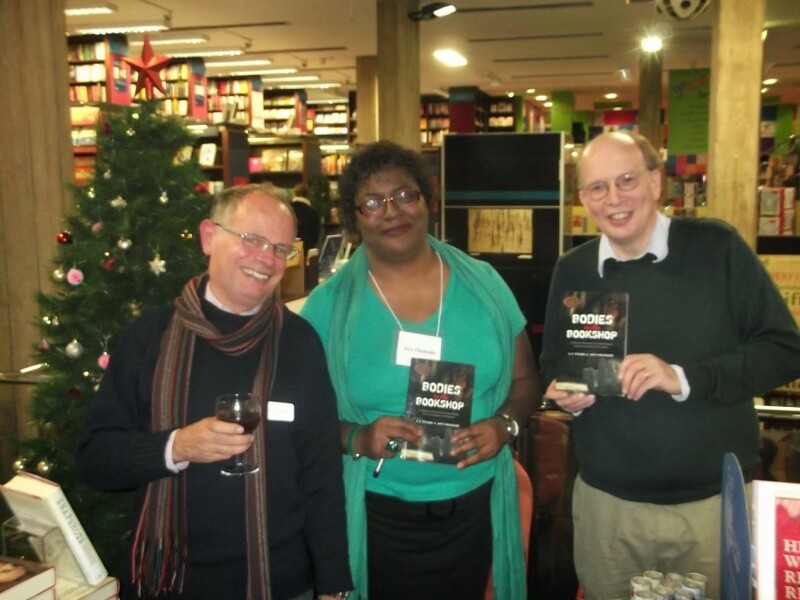 Devised by Heffers’ crime fiction supremo Richard Reynolds and edited jointly by the Detection Club’s Len Tyler and Shots Magazine’s Ayo Onatade, the Bodies anthology celebrates the famous ‘Bodies in the Bookshop’ parties held at Heffers for twenty years with twenty stories of murder, mayhem and a surprising number of rather lethal bookshops! Among the distinguished – positively star-studded – cast of contributors are: Andrew Taylor, Peter Lovesey, Simon Brett, Stella Duffy, Christopher Fowler and Ann Cleeves and at the launch itself a goodly number of contributing authors were on hand to sign copies, including Cambridge’s own Alison Bruce and Michele Spring, Suzette A. Hill and Ruth Dudley Edwards. All those assembled used the launch party to join in a toast in honour of the late P. D. James, following a heartfelt tribute from crime-writer Nicola Upson who described Phyllis James as ‘a friend of crime writing and a friend of Heffers’ to whom everyone in the room – readers and writers – owed a significant debt. Nicola Upson, who paid tribute to the late P D James, and RR.